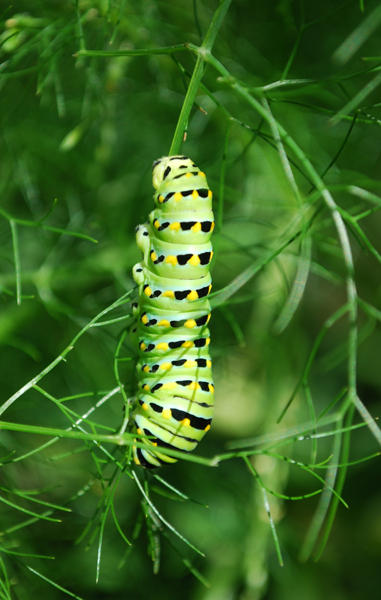 I’ve told you before that George and I rescue the anise swallowtail caterpillars and eggs that we find on fennel plants. 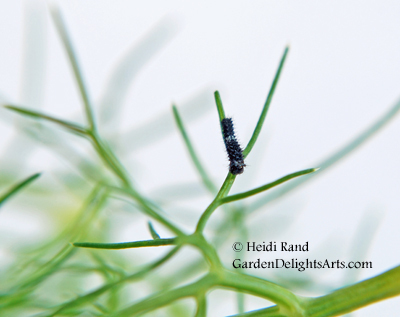 The fennel gets rangy this time of year and many people cut it down, not knowing that they’re killing caterpillars. 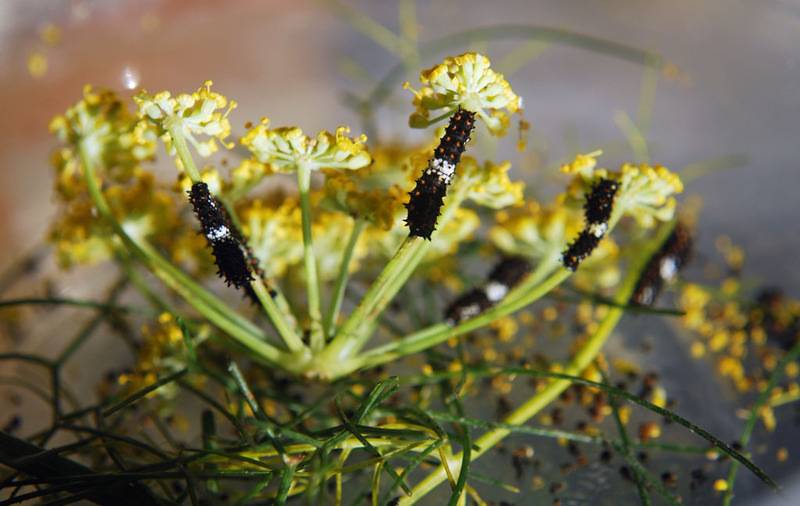 We bring the eggs and caterpillars inside, feed them fennel until they pupate into chrysalises, then release them after they emerge as adult butterflies. I rescued a large caterpillar and five eggs the other day from a parking lot in Berkeley, and the eggs have now all opened. This one is about 2 mm long. 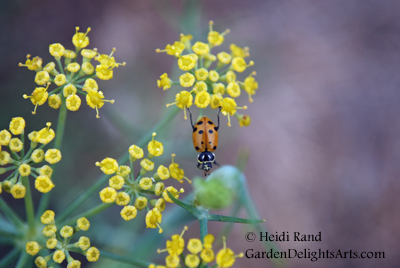 Today while searching some fennel near our house I found another insect – ladybugs – happily wandering around the fennel flowers, probably looking for aphids to feed on. Here’s one with a few of the characteristic black spots, and very intense red-orange color. Another one’s spots were barely visible, and its color was much less red. This one was moving from one flower to another. 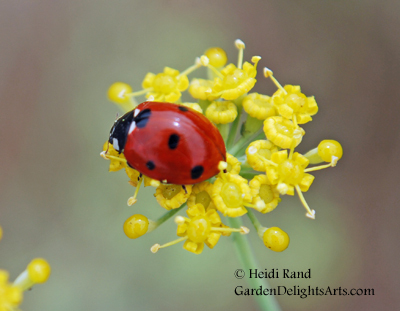 Some of the flowers had several ladybugs. 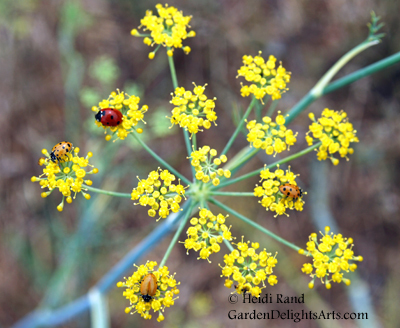 Does fennel grow on your property? 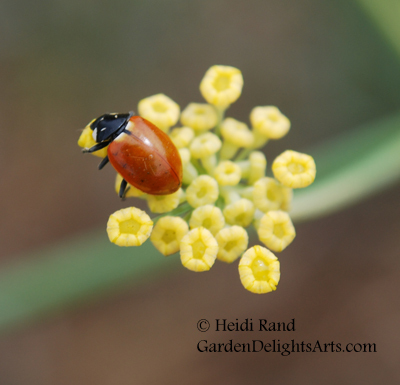 Please make sure to check for butterfly eggs and caterpillars, and for other helpful insects like ladybugs, before you cut it down. … or the caterpillars when they’re relatively small (these guys were about a half inch long). Today, I found a caterpillar which had thus far escaped our not-so-eagle-eyes. It looks to me like it’s ready to form its chrysalis. I brought it inside to protect it from predators and bad weather. I’ll let you know when it emerges. 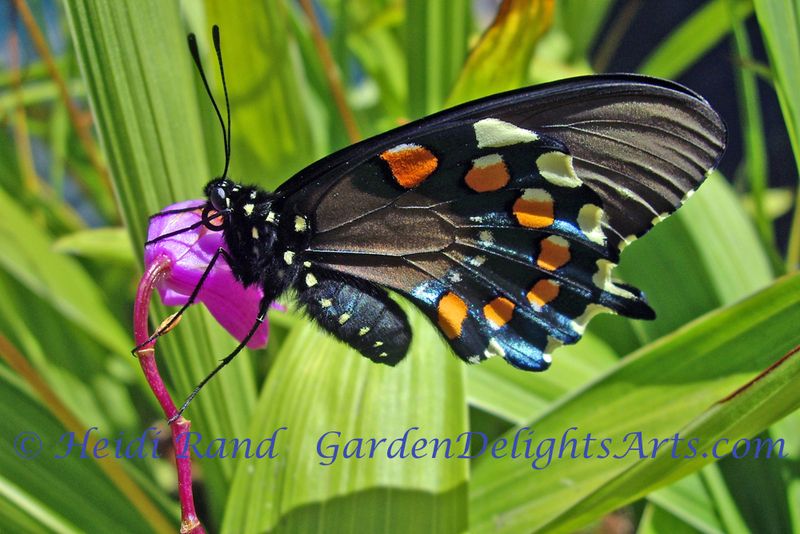 I recently shut down my smugmug site, where I had galleries of my photos showing the entire life cycle of the anise swallowtail butterfly and the monarch butterfly. I am reconstructing those on my website and will let you know when they’re up. Hopefully letting you know that will motivate me to get it done more quickly! 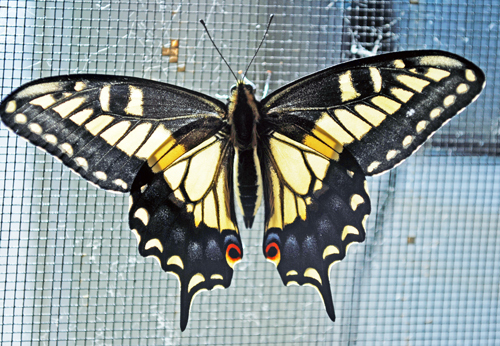 It’s a banner year for anise swallowtail butterflies, at least in our garden! A few weeks ago we saw a butterfly fluttering around the fennel plant in the back garden, and sure enough we found 13 eggs. We brought them all in and they’ve started to emerge. We’ve also had some chrysalises incubating for a year or more, and some of them finally decided to emerge as well. 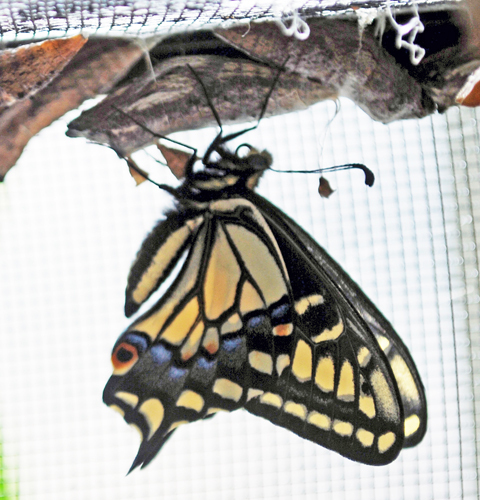 Three of the butterflies came out yesterday and four today. 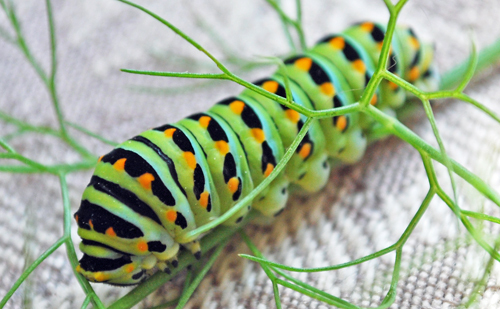 We check the fennel periodically for eggs and babies, and usually find them when they’re small, but this caterpillar eluded us until he had gotten quite large. 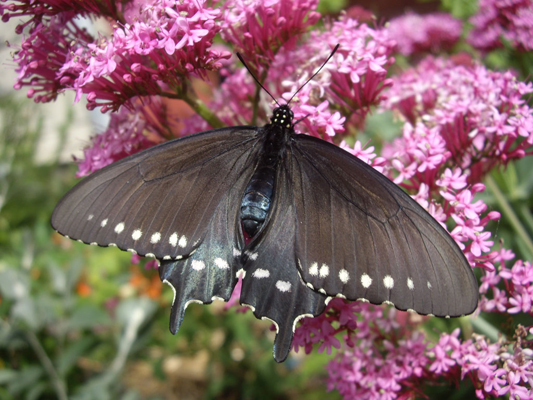 One of my favorite local butterflies is the Pipevine Swallowtail (Battus philenor). Here’s a photo of one that we raised a few years ago. Strikingly dramatic, it has black wings fringed with large white spots. 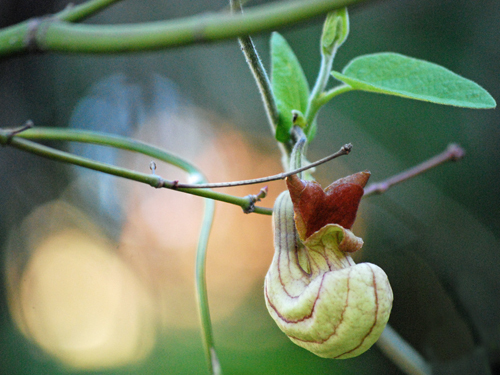 We’ve been growing pipevine in a few spots in our garden for several years, but haven’t yet been lucky enough to attract a butterfly to lay eggs on any of them. The vine in the front garden put out a profusion of pipes last week. 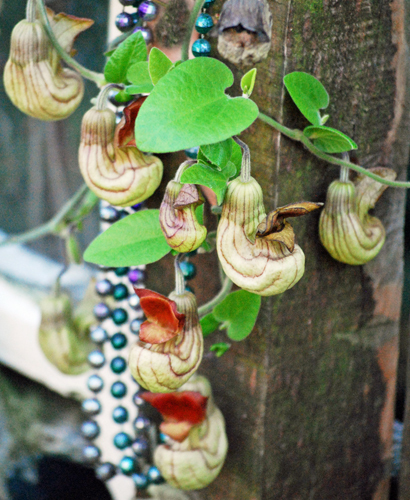 This photo shows one string of them – there are many more pipes zigzagging up the tree that the vine is twined around. 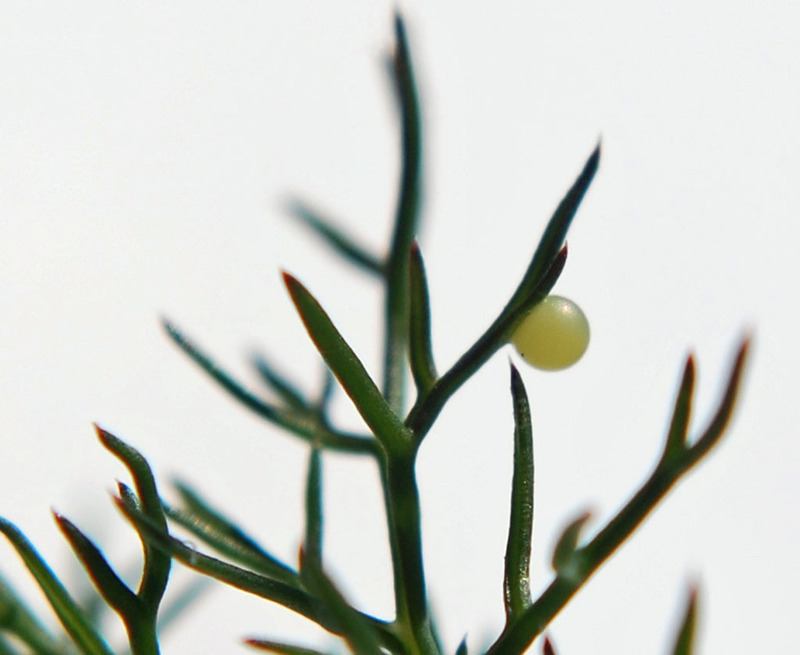 The plants need to get really large to attract the female to lay eggs. We have raised caterpillars from eggs that we rescued, and they ate the pipevine leaves voraciously. We had to forage to find them enough to eat! 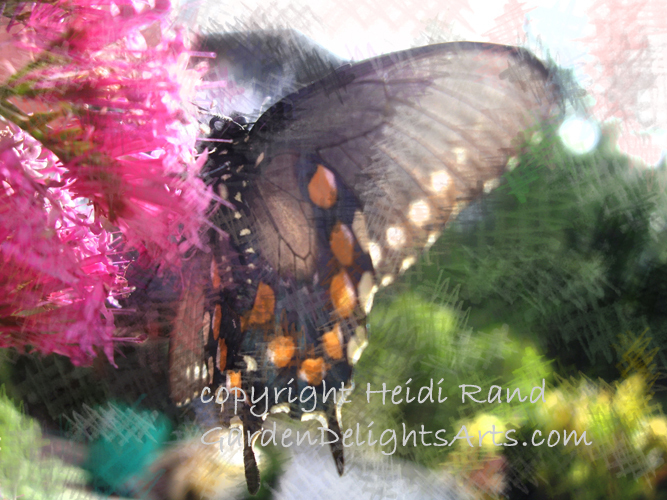 This is an “artsy” piece I made from my photo of a Pipevine Swallowtail on a buddleia flower. So this year we’re having pipevine dreams that a butterfly will visit our garden and lay some eggs. If you see one, please send her our way!